When Robert O’Malley ’44 left to serve his country in World War II, he also left his college days behind him – and with them, his hopes for the degree on which he’d set his sights. Little could the new soldier have anticipated that his baccalaureate would indeed be conferred – 77 years later and at the initiative of the son he never knew. It is Oct. 4, 1942. The St. Norbert College community gathers to dedicate a new, stately four-story brick building nestled along the bank of the Fox River on campus. Residence Hall – the college’s first dedicated dormitory building, now known as Burke Hall – quickly fills with students. One year later, 90 percent of those young men have left to serve their country. Some returned to St. Norbert College after World War II. Many did not. Every one of these students-turned-soldiers has a story. And, as Bill Manion ’73 recently discovered, one of those stories belongs to the biological father he never met. Manion had a happy childhood with his adoptive parents in Madison, Wisconsin. He never felt compelled to search for his birth parents until he and his wife [Betty (Saladin) Manion ’74] became grandparents and their children started asking about family health history. Manion’s search revealed that his biological parents, the late Robert O’Malley and Tina O’Mara, placed him for adoption in 1951, then married each other within a year and later had seven more children. Manion’s birth siblings revealed a remarkable coincidence: His father had also attended St. Norbert College. 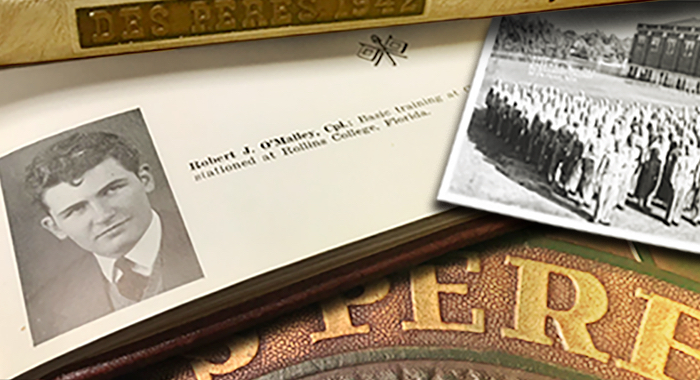 Bob O’Malley ’44 enlisted in the Army Reserve during his first year at SNC and was drafted into combat infantry during his third year of college. He became a prisoner of war when he was captured in France, then escaped with a comrade, making a dangerous trek through Poland, Ukraine, Turkey, Egypt and Italy before returning home to Iowa. “He worked in the construction business, in all kinds of weather, to feed a family of seven kids and a spouse,” says Mike O’Malley. “He was an initiator, a conversation-starter, a great debater, intellectually imposing and well-read. He was a friend to strangers and regularly found jobs for many. He lived with a life-confidence that served him well; he did not fear death.” Bob would live until the age of 66; he died in 1989. Manion felt compelled to work with his alma mater to recognize his birth father’s sacrifice. The SNC alumni office has been working with the president’s cabinet to bestow a posthumous honorary baccalaureate degree on Bob at this month’s meeting of the alumni board. The yearbook contains only nine photos of seniors still on campus in 1943-44. Of them, five were fraters – Norbertines studying to become priests. Most students who did not return after their military service in the 1940s are not yet included in the St. Norbert College database. Danen plans to initiate a student-led research project to track down these veterans and their descendants, and bestow more honorary degrees similar to O’Malley’s. The war rapidly depleted the student body, where only 50 civilian students remained by 1943. To fill the gap, St. Norbert became headquarters of an Army Specialized Training Program (ASTP), with 400 trainees arriving in July 1943. 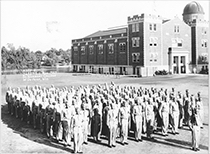 In the spring of 1944, after all the ASTP trainees were called to active duty, St. Norbert became home to an Army Specialized Training Reserve Program (ASTRP), designed primarily for high-school boys.